Located in Encino CA, El Mariachi Mexican Grill is a purveyor of fine Mexican dining from the best family recipes of "Familia Lopez"
Opened in May 2010, El Mariachi Grill is located just off the 405 fwy on Ventura Blvd in Encino CA. A "Cantina Style" Sports Bar & Grill, where you can enjoy some Micheladas, CoronaRitas or how about a MangoRita. With our live Mariachi playing traditional Mexican music. Ohhh can forget about the Tequila shots for all the Charros out there. But relax...is a Family Restaurant! El Mariachi Grill interior was designed to reflects the "Charro" culture of Mexico, that lives inside the Familia Lopez storied past, with newspaper articles, magazines & pictures paying tribute to the family's achievements. The multi-area restaurant offers a Banquet Hall in which one can arrange for any style conferences, events, meetings etc. melted cheese with chorizo served with flour tortilla. asada, fries, salsa, cream and guacamole. 10 buffalo wings served with side of ranch dressing. topped with beans, salsa, guacamole and sour cream. pico de gallo, steak and shrimp. served with sour cream, lettuce, guacamole and pico de gallo. Classic tortilla soup with chicken. El Mariachi classic meatball soup. served with romaine lettuce & your choice of dressing, topped with pico de gallo, black beans, cheese and tortilla strips. served with romaine lettuce, chipotle sauce, topped with cheese Caesar dressing and pico de gallo. served with veggies, cheese, romaine lettuce, Caesar dressing and pico de gallo with choice of meat. filled with iceberg lettuce, caesar dressing, cheese, pico de gallo, sour cream, guacamole and your choice of meat. Served with romaine lettuce, Caesar dressing topped with pico de gallo and tortilla strips. 3 tacos. Asada, chicken and carnitas with pico de gallo. Served with rice, beans and pico de gallo. served family style with choice of chicken, carne asada or carnitas, served with onions, cilantro, salsa quemada and corn tortillas, along with rice, beans and pico de gallo. 2 baja shrimp. Served with rice, beans and pico de gallo. served with veggies, onion and bell peppers. Served with rice, beans, pico de gallo and tortillas. served with veggies, onion, zucchini and bell peppers. Also rice and beans, pico de gallo, guacamole and tortillas on the side. Carnitas served with chipotle sauce, grilled onions, tomato, cheese and pico de gallo. Served with rice, beans, pico de gallo and tortillas. steak served with cebollita verde. served with rice, beans, pico de gallo and tortillas. served with veggies, steak and shrimp. Served with rice, beans, pico de gallo and tortillas. steak topped with homemade sauce not spicy, sour cream, cheese and pico de gallo. Served with rice, beans, pico de gallo and tortillas. served with grilled onions, tomato and cheese. Served with rice, beans, pico de gallo and tortillas. steak served with fresh jalapenos, tomato, onions and cheese. Served with rice, beans, pico de gallo and tortillas. steak served with homemade boiled potato and cheese. Served with rice, beans, pico de gallo and tortillas. steak served with enchilada on the side. Served with rice, beans, pico de gallo and tortillas. chicken topped with homemade sauce not spicy, sour cream, cheese and pico de gallo. Served with rice, beans, pico de gallo and tortillas. served with veggies chicken and shrimp. Served with rice, beans, pico de gallo and tortillas. served in a bed of rice, topped with ranchera sauce, cheese, sour cream and pico de gallo on the side. Served with rice, beans, pico de gallo and tortillas. topped with onion and cilantro. Served with rice, beans, pico de gallo and tortillas. served with fresh jalapenos, grilled onions, cheese and pico de gallo. Served with rice, beans, pico de gallo and tortillas. rice, beans, pico de gallo and sour cream. In celebration of #TacoTuesday - enjoy a unlimited amount of tacos for only $10.99 ! ALL-YOU-CAN-EAT TACOS! MichWednesdays refresh yourself every Wednesday with our signature #Micheladas, made with the freshest ingredients! Lunch Buffet every Friday only $14.95 from 11-30am-2:30pm. Come enjoy your lunch break MariachiGrill style. Starting at 7pm with Nelson & his famous guitar, followed by Paquita la del Barrio show at 8:30pm, & finishing of the night DJ Tropical in the mix every Friday night.! Starting at 7pm with Nelson & his famous guitar, followed by Mariachi Imperial at 8:30pm, & finishing of the night DJ Tropical in the mix every Saturday night.! 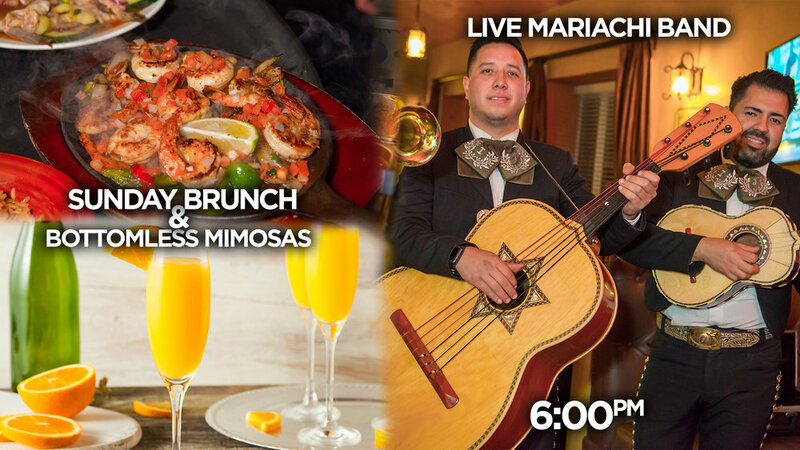 Sunday brunch buffet along with bottomless mimosas & at 6pm start enjoying some Traditional Mexican Mariachi.